Intracellular Ca2+ levels are important in proper cellular functions and have prominent roles in various cell sigling pathways and are crucial for muscle contractions. Indeed, an important step leading to muscle contraction is the massive release of Ca2+ ions from the endoplasmic /sarcoplasmic reticulum (ER/SR) to the cytosol. A battery of results suggest that specific K+ channels are important to counteract the Ca2+ outflow in order to neutralize the negative potential created by the movement of Ca2+ ions. It is believed that TRIC channels are responsible for neutralizing this negative potential. Trimeric intracellular cation-specific (TRIC) channels are critical for proper magement of intracellular stores. TRIC-A and TRIC-B both belong to this family and are both permeable to monovalent ions with a preference for K+ . Both channels are localized to the ER/SR membrane. Each TRIC subunit contains three transmembrane domains, a cytoplasmic C-terminus and a lumil N-terminus. Functiol entities are formed by homotrimerizarion. The activity of TRIC-A is regulated by voltage whereas that of TRIC-B can be regulated by different mechanisms. Knock out studies of these channels have shown that TRIC-A knock mice are viable while those of TRIC-B die at the neotal stage. TRIC-A is mostly expressed in excitable tissues like the brain and muscle while TRIC-B is ubiquitously expressed. 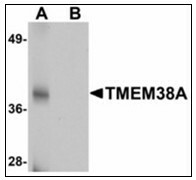 Western blot analysis of TMEM38A in rat skeletal muscle tissue lysate with TMEM38A antibody at 1 µg/ml in (A) the absence and (B) the presence of blocking peptide. Immunofluorescence of TMEM38A in mouse skeletal muscle tissue with TMEM38A antibody at 20 ug/mL. Western blot analysis of rat brain (lanes 1 and 4), mouse brain (lanes 2 and 5) and SH-SY5Y (lanes 3 and 6) lysates: 1-3. 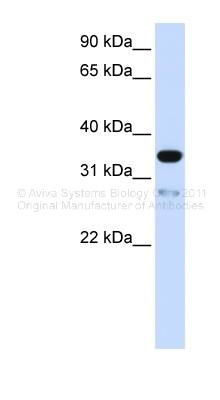 Anti-TRIC-B antibody, (1:200).4-6. 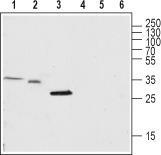 Anti-TRIC-B antibody, preincubated with the control peptide antigen. Expression of TRIC-B in rat testis. 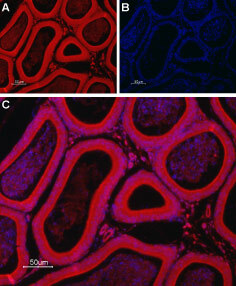 Immunohistochemical staining of rat testis paraffin-embedded sections using Anti-TRIC-B antibody, followed by goat anti-rabbit-Alexa-Fluor-594 secondary antibody. A. TRIC-B labeling appears in the columnar principal epithelium of the epididymis and in the endothelium of the surrounding blood vessels. B. Nuclear staining using DAPI as the counterstain. C. Merged images of A and B. 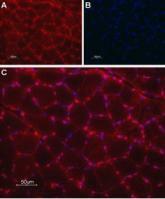 Expression of TRIC-B in mouse muscle myoblast (C2C12) cell line. Immunocytochemical staining of mouse paraformaldehyde-fixed and permeabilized muscle myoblast (C2C12) cell line. A. 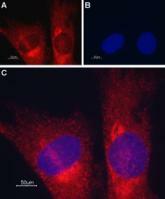 Cells were stained with Anti-TRIC-B antibody, (1:200) followed by goat anti-rabbit-AlexaFluor-594 secondary antibody (red). B. Nuclear staining using DAPI as the counterstain (blue). C. Merged images of panels A and B. 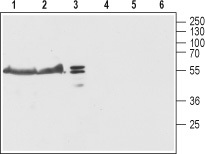 Western blot analysis of rat brain lysate (lanes 1 and 4) and mouse brain membrane (lanes 2 and 5) and skeletal muscle (lanes 3 and 6): 1-3. Anti-TRIC-A antibody, (1:200). 4-6. Anti-TRIC-A antibody, preincubated with the control peptide antigen. Expression of TRIC-A in rat skeletal muscle. Immunohistochemical staining of paraffin-embedded rat skeletal muscle sections using Anti-TRIC-A antibody, followed by goat anti-rabbit-AlexaFluor-594 secondary antibody. 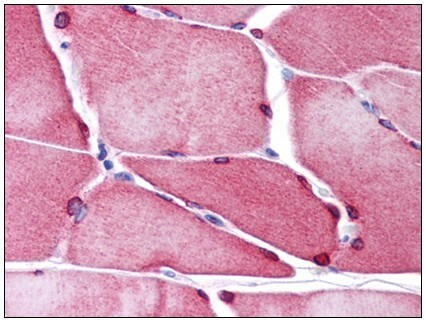 A. TRIC-A labeling (red) appears in the edges of the muscle fibers, where the endomysium is present. B. Nuclear staining using DAPI as the counterstain. C. Merged images of A and B. 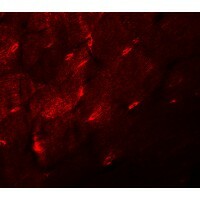 Expression of TRIC-A in mouse muscle myoblast (C2C12) cell line. Immunocytochemical staining of mouse paraformaldehyde-fixed and permeabilized muscle myoblast (C2C12) cell line. A. Cells were stained with Anti-TRIC-A antibody, (1:200) followed by goat anti-rabbit-AlexaFluor-594 secondary antibody (red). B. 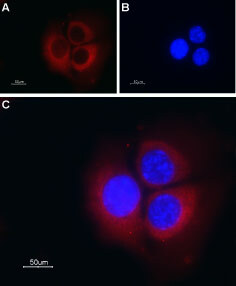 Nuclear staining using DAPI as the counterstain (blue). C. Merged images of panels A and B.